Futbol USA: Michael Bradley to Toronto FC: too soon? When Taylor Twellman announced on his twitter feed earlier this week that Michael Bradley was on the verge of signing with Toronto FC, many of us fans were in disbelief. 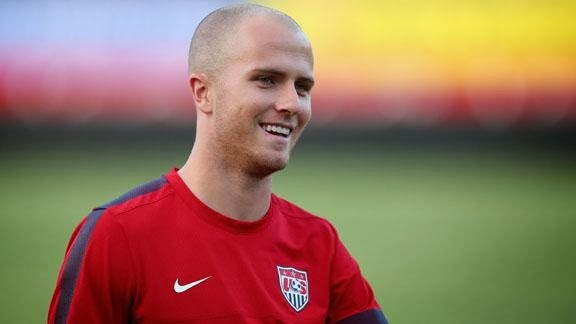 Michael Bradley to MLS? Yes, it was true and the most talented American soccer player was leaving Europe after ten years of pure ascent. The final figure paid to AS Roma was close to $10 million. No bargain for the talented US international and a credit to Toronto and MLS. But how does this affect the national team and Bradley's future? A year and a half ago the American invasion of top teams in Europe got started when Clint Dempsey signed with Tottenham at the end of the transfer window and Michael Bradley signed with the legendary AS Roma. American soccer had reached new heights. Could Altidore move to a Champions League team? Mix Diskerud? But last summer, after some soul searching, Dempsey made the move back to the United States to play for the Sounders on a $9 million transfer from the Spurs. Great catch for Seattle and the league for a man still in his prime at 30 years old. Bradley remained at Roma for the first half of the current season even though his playing time was cut down. Although there were signs he might move elsewhere for playing time, no one thought it would be to America. Certainly not in World Cup year. But the allure of a higher paycheck and the chance to play each and every week and remain a superstar was too much for Bradley to refuse. He had been in Europe for ten years so it seemed logical that he would want to try something different. However, at 26 he is right in his prime with room to grow further. Can MLS provide that for him? Perhaps not at the same level. MLS is still a growing league and even its best teams would struggle against mid table European squads. And what about the national team? In Europe, especially with Roma, Bradley had a chance to play against opponents of the highest level, the kind he will surely battle against at this summer's tournament in Brazil. And how does Klinsmann feel about all this? He loves MLS but he always wants players to push themselves. Let's remember that he wasn't all that thrilled with Dempsey's move stateside. So let's say this. . . Bradley is the best player the United States has to offer at the moment, no doubt about that. He is a complete player. For him and for the national team, the best thing would have been to remain in Europe and continue developing. Now the US has zero players in Italy and Spain so exposure to more varied styles will be lacking with Team USA. Credit MLS. They are making a statement by making national team stars the designated players in their teams. Gonzalez, Donovan, Dempsey, Wondolowski are all here with high salaries. Also here are Besler, Zusi, Eddie Johnson, Clarence Goodson and Bocanegra. Jermaine Jones and Onyewu might be on their way. America has a chance to create a stronger league and more fun to watch.